Since 2013, the Rev Jay Sidebotham has served as Director of RenewalWorks, a ministry of Forward Movement. RenewalWorks seeks to build cultures of discipleship in Episcopal congregations, with a singular focus on spiritual growth among congregants. He also serves as Associate Rector at St. James, Wilmington, N.C. 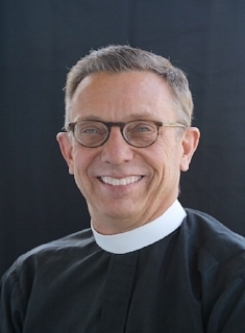 Previously, Jay served as rector in Illinois and North Carolina. He served as Vicar of St. Bartholomew’s in Manhattan, and as Associate Rector at St. Columba’s in Washington D.C. and St. Martin’s, Rhode Island. A graduate of Trinity College, Hartford and Union Seminary, New York, he was ordained to the diaconate in 1989 and to the priesthood in 1990. Prior to seminary study, he worked in New York in animation, illustration and advertising. He appreciates the opportunity to produce cartoons for the wider church, describing the joys and challenges of parish ministry. The Rev. Canon Stephanie Spellers serves as the Presiding Bishop’s Canon for Evangelism, Reconciliation and Creation, helping Episcopalians to follow Jesus and foster loving, life-giving and liberating relationships with God, each other and the earth. The author of Radical Welcome: Embracing God, The Other and the Spirit of Transformation and The Episcopal Way (with Eric Law), she previously directed mission and evangelism work at General Theological Seminary and in the Diocese of Long Island; founded The Crossing, a ground-breaking church within St. Paul’s Cathedral in Boston; and led numerous church-wide renewal efforts. A native of Frankfort, Kentucky, and a graduate of both Episcopal Divinity School and Harvard Divinity School, she makes her home today in New York's Harlem neighborhood. The Rt. Rev. Santosh K. Marray has worked extensively in promoting the Anglican/Episcopal Communion’s Five Marks of Mission and has led numerous evangelism, discipleship and missional initiatives across the communion; from planting and reviving congregations to re-imagining mission and leading through change. He served as commissary to the Archbishop of Canterbury and was a member of the Anglican Covenant Design Group. Bishop San was ordained to the diaconate and priesthood in 1981 and bishop in 2005. He has served as Bishop in the Diocese of Seychelles, and Assistant Bishop in East Carolina (2009-2012) and Alabama (2012-2016). Most recently this work has been demonstrated through his leadership in the Diocese of Easton – in leading the clergy and laity to craft and live into a unified identity and vocation (John 13: 35). He holds degrees from Codrington Theological College, Barbados; the University of the West Indies, Barbados; General Theological Seminary, New York; the University of Wales, UK, and Colgate Rochester/Bexley Hall Divinity School, NY. Registration opens October 8, 2018 with tickets available for $45.00.